The NSA is a non-profit organization located at Lake Cheney. Their mission is: To promote the art of sailing, sportsmanship, and water safety in Kansas. Lucky for us Kiteboarders we fall into this category. NSA members are a classy friendly bunch who allow us to use their facilities, which are located on the western shores of Cheney Lake. If you're wanting to make your kiteboarding a sailing experience the whole family will enjoy, check out what the NSA has to offer. The NSA puts on or has tons of activities like: camping, junior sailing, sporting events, olympic trials, dinners, and dances; there is something for everyone. Go to the links page or Click below for the NSA's website and further info. The jetty below creates pure butter when the wind is from the north in the spring or fall. Camping is available at,near, and around the NSA club area. Ruffing it to electrical hook ups are avialable. 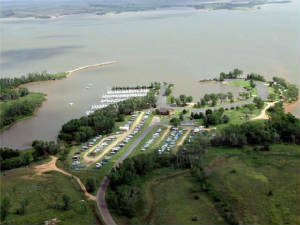 The camping on the eastern shore of Cheney Lake at M&M point (Kite Beach launch area when wind is from the south) has no electrical option at this time. All camp areas require a permit easily obtained the Kansas Deptartment of Wildlife and Parks (KDWP). 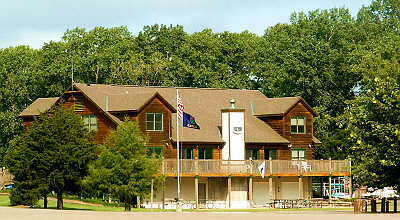 The KDWP has its main office at the lake on the west side of the lake, however they also have curtesy booths at each entrance to the lake. The following is a summary that regards some talk around the camp fire at a recent NSA Long Range Planning Committee meeting. Note the mention of a kiteboard launch area on the west shore (near Stone's Jetty). This is basically a summary of overall NSA meeting and a synopsis of a few emails: Rob Fresh, "At the last LRPC meeting, I mentioned that Kiteboarders like to use the moorings area by Stone's Jetty/NSA, when the wind is northerly." John Graves, "If you recall we have leased that shore area from KDWP (Kansas Department of Wildlife and Parks) with the promise to develop something over there maybe there is something we could do to make it more kite friendly without spending a great deal of money. I suspect Eric has some suggestions along these lines? Might be a good thing to put in our LRP that could actually be accomplished!" Basically all Kiteboarders know that all that is needed is a chainsaw and some clearing of trees and stumps. What could be cheaper? I'm sure we will need a good turn out at some meetings. We will probably also help, and or oversee any projects they agree to do in that area. That way we will be able to get more bang for everyone's buck. I will definetly keep everyone apprised of the developing situation of Stone's Jetty butter city launch!